Almost a year ago I started working in a chemical plant in shipping. I see a lot of labels come through my area. Some of the products are low toxicity and some are very toxic. Products that are very toxic require special packaging when it comes to shipping. They have to be inside a plastic bag with an absorbent pad inside the bag. Padding is placed around the products in the box and stickers are placed are on the box as to the toxicity of the products in the box. On a table, where does this toxicity lie? 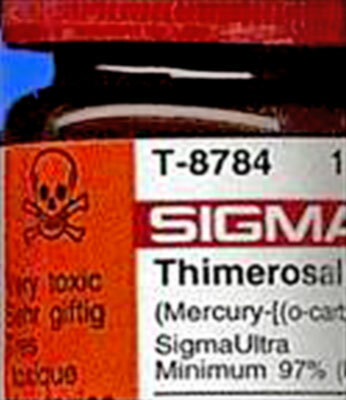 Even a bottle of Thimerosal has the Skull and Bones symbol on it along with the word toxic. It should be noted that no LD50 data exists for humans. The lower the LD50 value, the more toxic the substance. In general, chemicals with LD50 values less than 300mg/kg are considered highly toxic, those with LD50 values between 300 and 1,000 mg/kg are considered moderately toxic, and those with LD50 values between 1,000 and 5,000 mg/kg are considered slightly toxic. 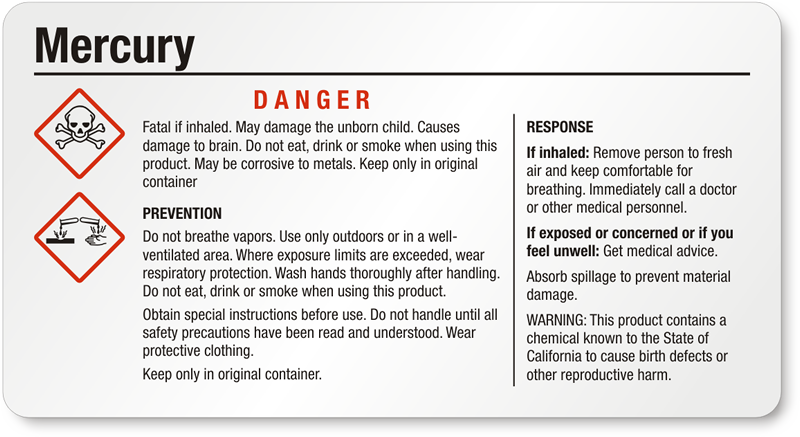 Because LD50 values depend on body weight, however, many chemicals that may not harm an adult may be toxic to a small child. DEVELOPMENTAL TOXICITY: Not available. The substance may be toxic to kidneys, liver, spleen, bone marrow, central nervous system (CNS). Repeated or prolonged exposure to the substance can produce target organs damage. Repeated exposure to a highly toxic material may produce general deterioration of health by an accumulation in one or many human organs. A few months ago, my work place had a flu shot clinic. It was totally voluntary. The form that was sent via email said that if you are allergic to Thimerosal you shouldn’t get the shot. Who isn’t allergic to mercury? When I received the email from HR that this was going to take place I replied back with the toxicity of the flu shot along with the MSDS sheet for Thimerosal. The guy heading it up replied back that he wanted me in his office at 8 am the next morning. I sent him the email at about 1 am (I work 2nd shift). I did talk to him when I came in and got blown off on the mercury content of the flu shot. I said that products in our plant that contain mercury have a skull & bones on them. Why are you allowing employees to be injected with mercury? His response … That is your opinion. Seriously? I’ve been researching the dangers of vaccines for almost 30 years & that is my opinion? A few weeks ago we had a safety meeting. We were told if we see something, say something. So, I had the MSDS sheet for thimerosal brought up on my phone and went to talk to the head of the safety after the meeting. Again, I brought up the mercury content of the flu shot. Again, I was poo poo’ed off. One of the HR people told me to come see her in her office to talk about this. After our lunch break that night, I was standing with the rest of my co workers waiting to do our stretching before getting back to work. The second shift lead came to me and told me that I was wanted in the HR office. My response – Here we go. His response was it’s not bad. I went into the office fully prepared to be fired or at least a reprimand of some sort. In her hands was an article from this blog. You have to be invited to see her blog, I haven’t been invited to see it but you can see the first 7 myths that she attacks in this article. I asked her about the content of mercury in the products of the plant and how they are treated as highly toxic. She said they aren’t the same thing. As you saw above, Thimerosal is toxic. I knew at that point anything I had to say was going to fall on deaf ears. I didn’t want to risk my job by setting her straight in person. It was total frustration to deal with someone who seemed so open minded … but so closed to reality at same time. Read more great articles by TLB Contributing Writer – Lori. SOURCE Please visit Lori’s blog Vaccine Free Health for more pertinent articles and information. Vaccines: Are You a Conspiracy Theorist … Or a Critical Thinker?